This summer, we may have been doting on spaghetti-strap slip dresses, "naked" strappy sandals, and Carrie Bradshaw bags of the '90s, but the fall season is unquestionably all about '80s excess. 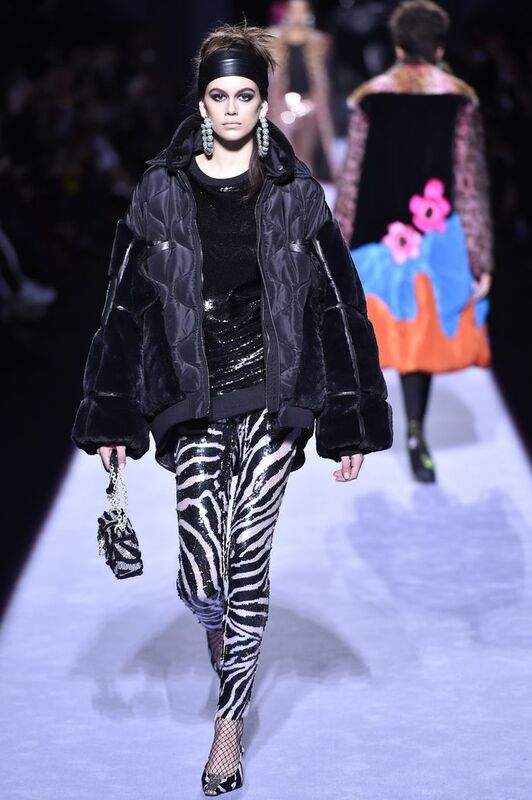 In fact, '80s influences could be seen everywhere on the F/W 18 runways—from Tom Ford's glitzy metallics to shoulder-padded party dresses at Saint Laurent to oversize proportions of color blocking at Marc Jacobs, not to mention electric neons, animal-print sequined dresses, ruched leather, and amped-up evening looks that sashayed down the catwalks of practically every major designer's show. It's safe to say if you like the '80s, you're going to love fall 2018. Glitzy accessories and animal prints were huge at Tom Ford. Power shoulders took over the show at Saint Laurent. Marc Jacobs made us crave oversize overcoats in bright neon shades. Amped-up party dresses with larger-than-life ruffles stole the show at Marc Jacobs. Miu Miu made the case for '80s high-shine patent jackets. You heard it here first: Acid-wash jeans are back thanks to Miu Miu. Moschino had us wanting to update our cocktail dress attire ASAP. Simply striking '80s vibes emanated from the Tom Ford runway. While the trend is pure eye candy on the runway, trying to pull it off in a fresh, modern—and, let's be honest, less terrifying—way is a different thing altogether. Luckily, we found some ultra-wearable pieces that give a nod to the '80s while still exuding a contemporary of-the-moment style. Scroll below to take on the trend. We're obsessed with this striking yet ultra-wearable hot-pink frock. Glitzy chandelier earrings are the easiest way to add a dose of decadence to your outfit. If you don't want to wear a full-on '80s outfit, simply add these glamorous slingbacks to your everyday look instead. The easiest way to take on the trend this fall? A leather jacket with bold shoulders. Pair a high-shine animal-print top with your skinny jeans for an edgy '80s vibe. Add a dash of glitz and glam to your look with these crystal-embellished shades. Tuck a colorful knit sweater into these cool acid-wash jeans for a more laid-back look. A chic and modern way to wear '80s slouch boots. Layer under a leather jacket or trench for an '80s look in 2018. A bold animal print looks fresh when paired with this season's trending fuchsia hue. Style these with your favorite pink top or skirt. Long gloves were all over the fall runways. Roll up the sleeves of your coat and slip them under so they peek through. We're getting Marc Jacobs runway feels in this oversize vibrant topper. Available in Italian sizes 40 to 44. Tie your blazer tight at the waist with the help of a larger-than-life wide belt. Make your outfit roar with an animal-print blouse. Keep the rest of your outfit simple and let these boots do the talking. Dress up even the most casual of outfits with a blingy diamante bag. Kaia Gerber wore a very similar pair during Tom Ford's electrifying runway show. A power dress if there ever was one. Tie a fuchsia belt bag over an oversize coat or jumpsuit. Just add glimmering heels to this sleek '80s silhouette. Layer this under a leather jacket or sweater and let the stunning sequins peek through. Dress down a high-shine patent leather skirt with a simple white tee. Up next: six fall trends I can't wait to wear.